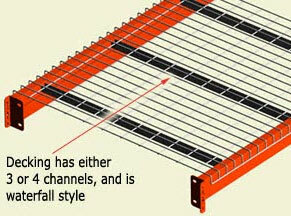 These racks come with sturdy wire decking, ready to install. Simply order the size needed for your operation. If you're building a row, select a single starter pallet rack and connect adders to utilize common uprights. These racks have two wire decks per level unless otherwise stated. Wire decking gives you tremendous structural strength—tough and durable wire construction with underlying metal supports to match the beam capacities. If you cannot find the size you need, contact Customer Service for expert assistance.